You can imagine a typical scenario where guys, huddled around a table, are discussing what attracts women. 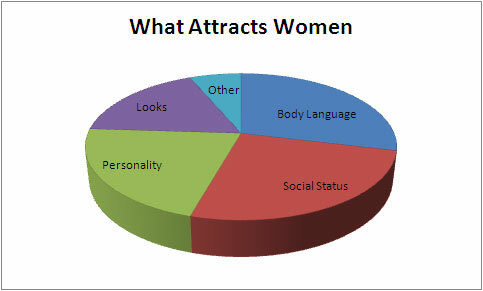 They’ll usually point out that power, money and looks are the key factors in attracting females. Although those factors might help, they certainly aren’t the only things and definitely not the most powerful ones. We’ll explore how women work and what really triggers attraction. One of the large differences between men and women is that females are usually much more prone to notice the details than men. While most guys will only notice an attractive body and a nice face, women will notice posture, body language, personality, social status and the list continues. This is great news for men everywhere because, let’s be honest, us guys usually look little rough around the edges. That’s fine because looking a little rough alludes to being strong and tough. Women LOVE that. If guys were trucks, would you really want your V8 truck to have a cute spoiler? No, you’d want a push-bar, huge mud tires and dirt. Be a man and women will love it. Studies show that nearly 88% of human communication is non-verbal and is done through body language. This is why it is essential that you have great body language if you’re going to succeed in attracting women. What’s the best way to get great body language quickly? Well… the absolute quickest way would be to fake it. If you’re reading this on your BlackBerry or IPhone while in a bar, then sit up straight but don’t be stiff. Then you want to have a slightly leaned back appearance, as if a strong wind was pushing you back. Finally, your head should be up! The biggest mistake guys make in terms of body posture is to have their head down. Look up! Now the first time you take on this position, it’s likely that you’ll be pretty tense. The trick to having great body language is to be like this and relaxed at the same time. Unfortunately, the chances of success if you’re faking body language are slim to none. About 5 minutes later, you’re likely going to forget to stand straight and slouch back to your old posture. After all, you’ve been the other way for years so it’s not in a few minutes that you’ll forever alter your posture. If you’re truly serious about having a good posture (and you should because good posture is very attractive to women), then what you need to do is work on it on a consistent basis. For starters, you’ll need to begin exercising. Why? Because when you exercise, your body naturally takes a very attractive posture. After you’ve been lifting weights for an hour, you won’t be slouching nor will your head be down. Proper exercising produces naturally good posture. You can use this to your advantage and exercise before going out! The second most important thing that attracts women to men is social status. Everything that you do, say or omit saying speaks about who you are, where you come from and where you’re going. How valuable you are to your friends, family, work and society in general will determine the level of attraction she feels for you. If you’re important in this world, then she’ll be attracted to you. If you’re insignificant, then … well, you better become significant. This is why the rock star is always so attractive to women, he has hundreds (if not thousands) of girls competing to get him while he’s on stage. Guys want to be him and girls want to be with him. All this social proof makes him very attractive… even if he doesn’t dress nicely and even if he’s a douche. You don’t have to be a rock star in order to have massive social proof. When you speak to a girl, make sure to mention in a very subtle way that your friends think you’re great, that you’re very valuable at work and that people want to be around you on a consistent basis. It doesn’t have to be much, but if you have one person looking up to you, then that’s enough. The problem that most people encounter when trying to demonstrate social proof is that they come off as show offs. Don’t try to impress people by telling them your accomplishments or how other people like you. When you try to impress people, you automatically lower your own value. It’s counter-intuitive so I’ll explain with an example. If a guy walks into a bar and says: “Hey, look at my car, I have a brand new BMW parked outside”, people will automatically think he’s compensating for something and he really doesn’t have anything going for him. Contrastingly, if that same guy walks in to a club, and as he’s pulling out his wallet, people notice that he has BMW keys, they’ll automatically assign him much higher value. In both cases, the social value is the same, it’s just how it’s displayed that is different. If you can let others discover your value, then they will appreciate it a lot more than if you simply go up to them and tell them. What if you don’t have value to start with? Well, let me tell you, everyone has some value. You just need to find it. Maybe your friends think you’re amazing, or maybe your family does. Maybe you’re good at work or maybe even you have a huge following on YouTube. Whatever it is, you should figure out a way to subtly bring it out when people are getting to know you. You might look like a douche, but if 3 million people watch you online every week, you automatically gain social status in my books (SxEPhil, I’m looking at you). The last major component to attracting women is your personality. If you’re vibrant with energy, you can make them laugh and have an honest perspective on life, then you’re going to be very attractive to them. It’s a rare combination these days. Most people are bored with life, so if you can stand out and be excited about living, you’ll be someone they want to be around. People are drawn to excitement so much that they’ll do ridiculous things just to be around you. The same can be said about being funny. If you’re naturally funny you’re immediately one step closer to being good with women. Women love to laugh and whoever can make them laugh will be one step closer to being the ideal mate in their minds. If you’re not a naturally funny guy (and that’s ok), then you can learn how to be. There are great books on comedy and our media is literally flooded with comedy. Watch, absorb and then use it. If you don’t have any social status, and you have bad posture and you just plain don’t know what to say to women… then you need to start working on the basics. Gain social status by making friends, get good posture by going to the gym and go read up some tips on how to approach women. If you do all these things on a consistent basis, you’ll naturally become attractive to women. Don’t think about how to attract women, instead concentrate on being valuable, healthy, knowledgeable and energetic. The rest will come by itself. i am deaf guy i seem some hearwomen person laugth me cuz i ihave show body language in some siign language and funny some chat with wirte make girls. or nut work?